Two French companies have launched what they say is the world’s first driverless public transport bus service in a suburb of Lyon. Operating under the name NAVLY, two 15-seater minibuses will run alternately on a 1.35km circuit away from other traffic in the eco-friendly Confluence district of the French city. The service has been developed by NAVYA, specialists in innovative mobility solutions and Keolis, the international public passenger transport company, and has the support of the Metropolis of Lyon combined local authority. It boasts ‘100% French cutting-edge technology’. The operators said the service is part of a long-term trial and its aim is ‘to become an enduring long-lasting service for the city’. 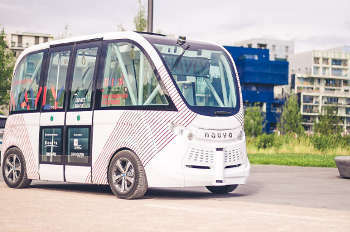 NAVLY complies with the public safety rules for autonomous shuttles to operate on the road is approved by the French Ministry of Ecology, Sustainable Development and Energy. The shuttles are free for all users and have room for 11 seated passengers. Although the vehicle is autonomous, a NAVLY operator will be on board at all times ‘to ensure the safety of passengers and to answer any questions’. The vehicles can reach speeds of 45 km/h but will be limited to 20km/h during the trial. Pictograms on the floor of the vehicle mark out the route, which comprises two terminus and three intermediary stops.